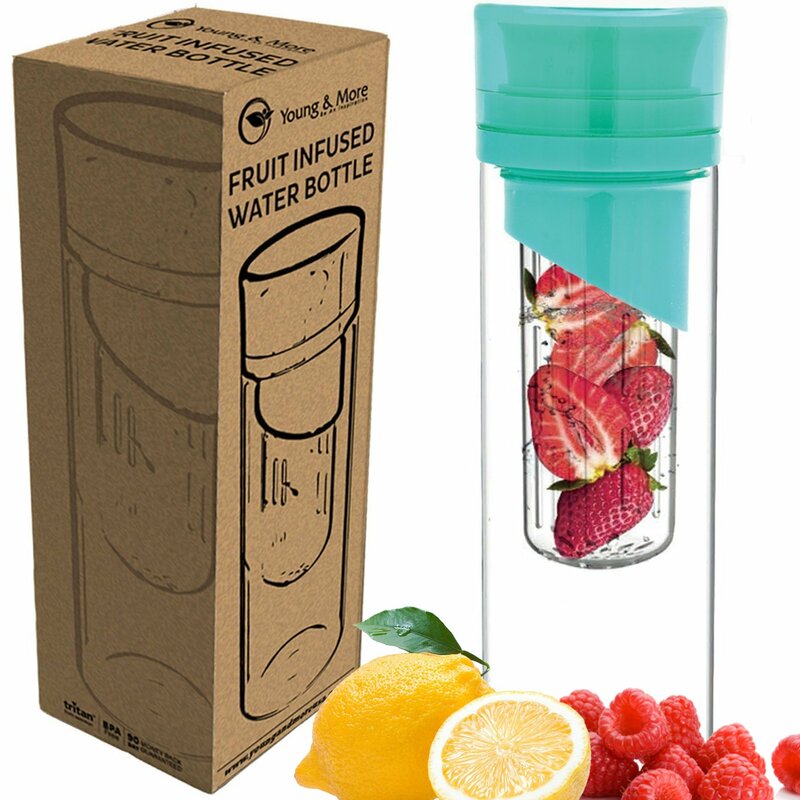 Home › Home and Kitchen › Infuser Water Bottle 24 Oz - Made With Tritan Bpa Free - Young & More N2589 -..
Infuser Water Bottle 24 Oz - Made With Tritan Bpa Free - Young & More N2589 -..
FREE RECIPE EBOOK BONUS: "20 Invigorating Infused Water Recipes" - This amazing ebook will be sent to your email address in PDF format when the product is shipped. SAVE MONEY: Young & More bottles are made from BPA FREE TRITAN PLASTIC which is the best material for plastic products. There is no need to spend money on bottled water - you can reuse this infusion water bottle over and over again! 90 DAY SATISFACTION GUARANTEE: If you decide this bottle is not for you, simply contact us and we will issue a full refund - no questions asked. In case you are shipped a defective product, let us know and we will send you a replacement bottle right away! Color: Turquoise BEWARE OF COUNTERFEITERS. Genuine Young & More brand products are fulfilled by Amazon & only from It's a known fact that too much sugar can increase the risk of diabetes and promote weight gain. Infused water is an exciting way to turn bland water into healthy, flavorful creations. Unlike sodas and juices, infused water has no added sweeteners - only the delicious taste of the naturally occurring sugar from the fruit or herbs you put inside. This makes infused water an ideal beverage for persons at risk of diabetes as well as those who want to lose weight by reducing their sugar intake. Our Young & More water infuser bottles make it easy to create simple, delicious alternatives to quench thirst and fight the sugar crave. Just fill the tumbler with filtered water and then add fruit of your choice, shake well and drink. Whether you choose to use your favorite fruits like cherries, watermelon or citrus, or add invigorating herbs, you'll love the taste of infused water as you sip on a fresh dose of natural vitamins and minerals. The accompanying strainer and water infuser cage separates the fruit from the liquid, releasing only the natural flavors and preventing seeds and pieces of fruit from floating into your drink.